Weary travelers find shelter in a mysterious Welsh manor in this definitive "Old Dark House" thriller and cult movie favorite by horror pioneer James Whale (the director of `Frankenstein`, `The Invisible Man` and `The Bride of Frankenstein` and subject of the recent film `Gods and Monsters`). Greeted with an animal-like grunt by the mansion`s hideously scarred butler (Boris Karloff), three disoriented voyagers (Melvyn Douglas, Raymond Massey and Lillian Bond) find themselves in the unwelcoming company of the psychotic Femm family, whose members include a religious fanatic obsessed with mortality and other matter of the sinful flesh (Eva Moore), her browbeaten brother (Ernest Thesiger), and a scripture-quoting homicidal pyromaniac (Brember Wills)... all watched over by their androgynous, 102-year-old father (Elspeth "John" Dudgeon). Relieving the story`s overwhelming weirdness are Charles Laughton and a young Gloria Stuart (`Titanic`) as two confused visitors to the strange estate. 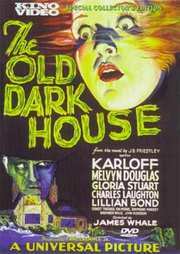 As witty and surprising as it is darkly unsettling, `The Old Dark House` is a ghoulishly delightful treat, a one-of-a-kind macabre comedy blanketed with rain-soaked, gothic eeriness orchestrated by one of the foremost directors of the American horror film. Audio Commentary by James Curtis (author of James Whale Biography "A World Of Gods And Monsters"